Since 2013, the US-led alliance triangle with Japan and South Korea has defied expectations. Drawing together articles commissioned from leading experts in all three countries by the online journal The Asan Forum, this book reconsiders what we thought we knew about the three legs of this triangle. Varied chapters cover the US-South Korea alliance at 60 years, Japan-South Korea relations under stress, Japan’s national security policy, US relations with both allies, and Japanese and Korean national identities. A picture emerges of two strong US alliances increasingly at odds with each other, and of Japan-South Korea relations newly troubled not only by intensifying national identities but also by divergent strategic calculations. 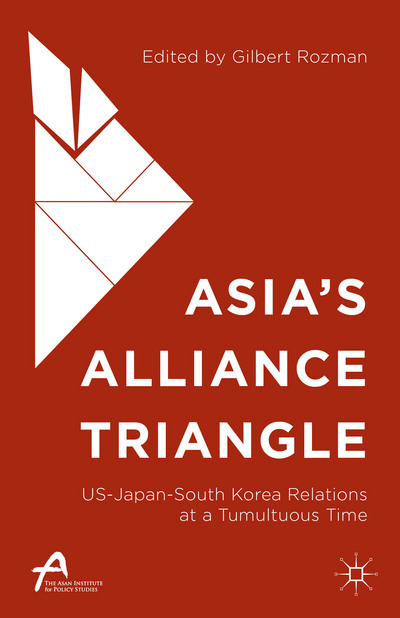 This volume shows how vital this triangle is to understanding US policy in Asia by bringing to light the dynamics of triangularity in the shadow of China’s rise and the North Korean threat. Gilbert Rozman was on the faculty of Princeton University from 1970 to 2013. In 2013 he began serving as the editor of The Asan Forum, an online journal on the international relations of the Asia-Pacific region. His writings bridge sociology, history, and political science, concentrating on the states of North East Asia. The Asan Institute for Policy Studies is an independent think tank located in Seoul, South Korea, that provides innovative policy solutions and spearheads public discourse on many of the core issues that Korea, East Asia, and the global community face. The goal of the institute is not only to offer policy solutions, but to train experts in public diplomacy and related fields in order to strengthen Korea’s capacity to better tackle some of the most pressing problems affecting the country, the region, and the world today.